Directions: When applying for an Arizona driver's license, applicants must take and successfully pass a a knowledge exam. The written test for a regular driver license consists of 30 multiple-choice questions. You take the test at a computer work station using a touch screen. A score of 80% or higher is required to pass the actual examination. Questions are taken from the Arizona Driver License Manual. Please thoroughly study the manual before taking the test. 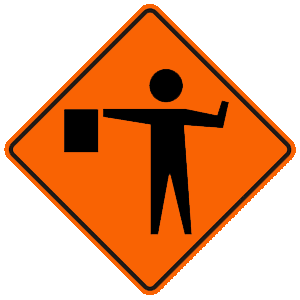 A construction flagger is ahead. A police officer is ahead. A parking attendant is ahead. This sign warns that there is a flag person ahead. Always follow directions given by a flagger. Flaggers normally wear orange or yellow vests, yellow-green shirts, or bright jackets. They use paddles and red flags to direct traffic through the work zone and to let workers or construction vehicles cross the road. Leave your vehicle in the traffic lane until law enforcement arrives. Move your vehicle out of the traffic lane, if possible. Not move your vehicle for any reason. After a collision, if no one has been injured or killed and you can safely do so, you should move your vehicle out of the traffic lane. Closer to the oncoming vehicles than the parked vehicles. Closer to the parked vehicles than the oncoming vehicles. A middle course between the oncoming and parked vehicles. If there are oncoming vehicles to your left and a row of parked vehicles to your right, the best thing to do is to split the difference. Steer a middle course between the oncoming cars and the parked cars. To keep your engine warm. So others can see your vehicle. To warn others of bad weather conditions. On rainy, snowy, or foggy days, it may be difficult for other drivers to see your vehicle. Under these conditions, headlights make your vehicle easier to see. If the weather requires you to turn on your windshield wipers, you must also turn on your low beam headlights. All vehicles are traveling at about the same speed. One lane of traffic is traveling faster than the other lanes. One vehicle is traveling faster or slower than the flow of traffic. Collisions are more likely to happen when one driver moves faster or slower than the other vehicles on the road. Driving faster than other traffic increases your chance of being involved in a collision. Driving more slowly than other traffic is also dangerous because it can increase the risk of a rear-end collision with your vehicle or cause other drivers to swerve to avoid hitting you. On opposite sides of the steering wheel. Next to each other on the top of the steering wheel. On the top and bottom of the steering wheel. Both hands should be placed on opposite sides of the steering wheel. This position is comfortable and promotes safe turning on high-speed roadways. You have allowed the wheels of your vehicle to run off the edge of the pavement. What should you do first? Turn the front wheels slightly to the left to edge the car back onto the pavement. Hold the steering wheel firmly, release the gas pedal, and gently apply the brakes. Apply the brakes and turn the front wheels sharply to the left. If your vehicle leaves the roadway, hold the steering wheel firmly, release the gas pedal, and gently apply the brakes. Wait until your speed has reduced, check the traffic, and look for a place to safely return to the roadway by merging back into traffic. Overcompensating by jerking the wheel to return to the roadway can cause you to lose control of your vehicle or may cause your car to go into other lanes of traffic. When should drivers adjust their mirrors, seats, and steering wheels? Before turning on their vehicles. While backing out of their driveways. Before reaching speeds of 55 mph or above. Prior to starting the vehicle, drivers should adjust their steering wheel, their mirror, and their seat. They should also be sure their brakes and turn signals are in working order before they begin driving.